As an online retailer of engagement rings and fine jewelry, we are able to offer our settings for affordable prices. Today, I wanted to share some of our most affordable engagement ring settings that are full of sparkle and brilliance. These engagement ring settings each currently start for less than $1000. 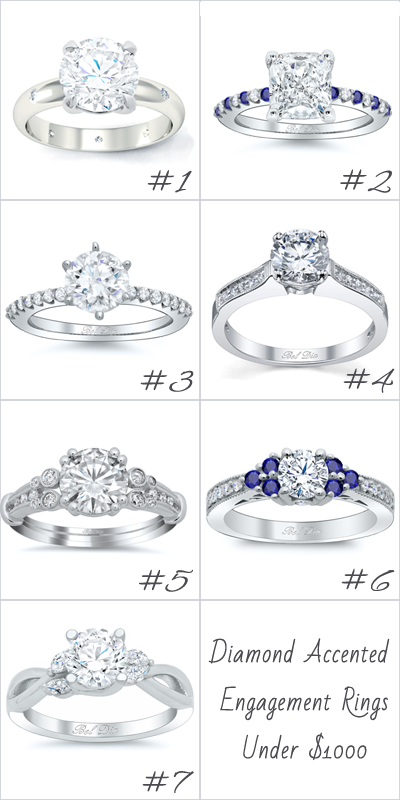 Each of these diamond accented engagement rings is available in your choice of precious metal and finger size. These engagement ring settings do not include the center stone. If you have a center stone already, we can manufacture the ring to your stone’s dimensions and you may have it set locally. deBebians offers certified loose diamonds, which you may browse on our loose diamond search or you may request a Personal Diamond Shopper to provide a complimentary list of diamonds that work with your needs and budget. We also have Moissanite from Charles & Colvard available. When choosing deBebians, is it easy to build your dream engagement ring due to the endless options that we offer.